< Back or Read "Rock and roll machinery"
The progression of rock music, and the way it fractured into multiple styles, is essential to understanding the roots of Rush, as well as Neil Peart's drumming style. Then in 1958 the rock and roll fire started to die, precipitated by a few key events: Little Richard left show business, Elvis joined in the army, Buddy Holly died in a plane crash (along with rising stars Jiles Perry "The Big Bopper" Richardson and Ritchie Valens), Chuck Berry was prosecuted and went to jail, and Jerry Lee Lewis was disgraced. 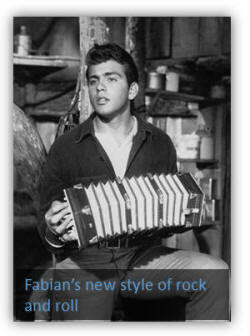 These events, as well as a payola scandal that destroyed the career of early rock and roll promoter Alan Freed, helped bring about an era of sugar-coated pop music masquerading as rock and roll (exemplified by Fabian). 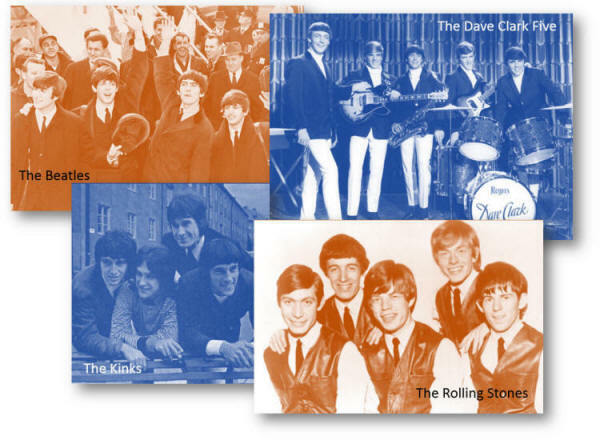 When the first British bands arrived in North America in 1964, including The Beatles, The Dave Clark Five, The Kinks, and the Rolling Stones, their more authentic style of rock, which tapped into the R&B roots, gave audiences what they'd been missing. It would end the fake rock era of the Fabians. It also created a wave of excitement unlike anything seen before. While Peart was still too young to be "enthralled" by the music of the Beatles and the Rolling Stones, a few years later, just as he started playing drums, a second wave of British bands hit North America. Peart's original inspiration to play the drums was jazz drummer Gene Krupa; but it was the music produced by these second wave bands (as well as their drummers) that lit a fire in him. One such drummer was The Who's Keith Moon. His adventurous, technical style, served as an early model for how to break the rules. Instead of just keeping time in the background, Moon's phrasing and style supported the music and the vocals with wild fills and crashes. His onstage antics and animation behind the kit also connected with audiences. 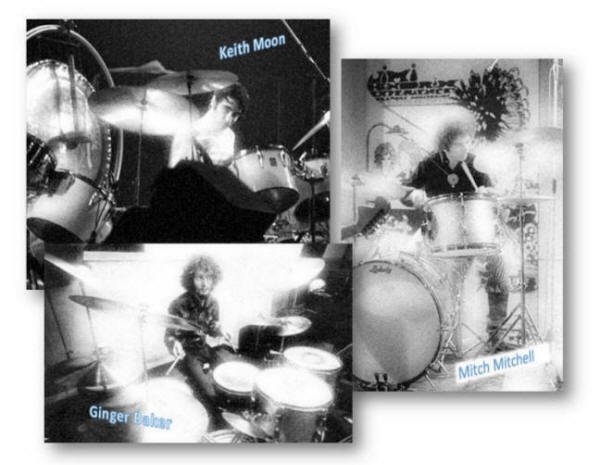 Moon's influence was soon followed by Ginger Baker of Cream and Mitch Mitchell of The Jimi Hendrix Experience. And while he didn't know it at the time, these drummers, as well as others in the late 1960s — with their more improvisational styles and fundamental role in a song's composition — were integrating the jazz drumming style with rock and roll and R&B. But they also brought drumming to the forefront again, much like jazz drummers Gene Krupa and Buddy Rich. Neil Peart would continue to refine and pioneer this style over the next 40-plus years. He redefined the image of a modern drummer with his intricate drum parts, exciting drum solos, and philosophical lyrics. And like his idols Gene Krupa and Keith Moon, Peart would also shine the spotlight on the drummer in a big way. Read more about Neil Peart's drum influences. 1 Altschuler, Glenn C. (2003-08-07). All Shook Up: How Rock 'n' Roll Changed America (Pivotal Moments in American History) (p. 8). Oxford University Press. Kindle Edition. 2 Lee, Geddy, Lifeson, Alex, and Peart, Neil. Permanent Waves. Rush. Mercury, 1980. CD. "The Spirit of Radio" lyrics by Peart. 3 Altschuler, Glenn C. p 162. 4 Peart, Neil. Traveling Music: The Soundtrack to My Life and Times (p. 67). ECW Press. Kindle Edition. For any questions, comments, or feedback, please send email to neilpeartnews@outlook.com.